Picture books bring the world into our homes. Through picture books, our children absorb language, are introduced to new concepts, explore new worlds and make friends with a wide variety of characters. Reading with our children helps them understand more about themselves and others. 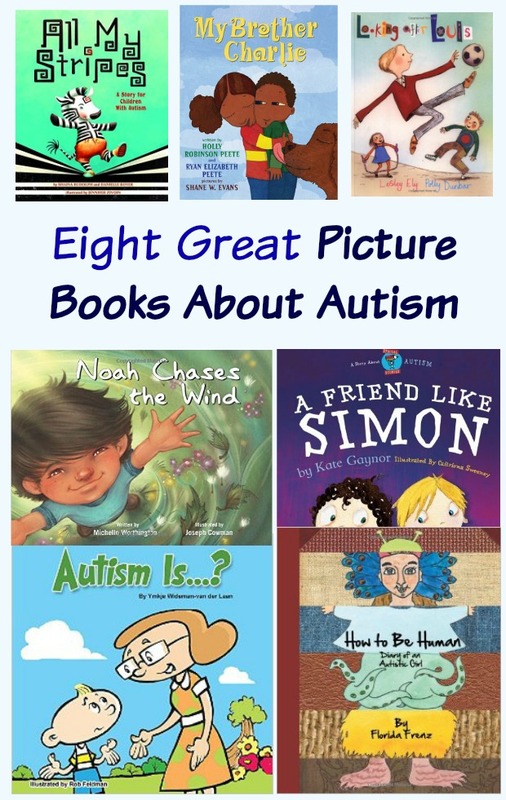 Picture Books About Autism will help children gain a better understanding of themselves or others. Autism can be a confusing topic to explain to a child. Picture Books about Autism can explain what that means on a level that the children can understand. While you read the books with your children, stop and ask questions. Ask them how they feel about the situations and the characters. Ask them what they would feel or what they would do if they were the characters in the book. Talking and reading together is one the best ways to build language skills and understanding of themselves and the world around them. My Brother Charlie By Holly Robinson Peete & Ryan Elizabeth Peete is a book for siblings of children with autism spectrum disorder. Written in clear simple language from the sister’s perspective the book gives readers a look at what autism looks like for this family. Children will be able to relate to the characters and draw parallels between themselves or someone they know. All My Stripes: A Story for Children with Autism by Shaina Rudolph & Danielle Royer. Illustrated by Jennifer Zivoin is a vibrantly illustrated book about Zane the Zebra. Zane the Zebra doesn’t do things in the same way as other children in school. Others paint with their hooves, he uses a paintbrush. Instead of studying a planet, he creates his own. The book focuses on how he learns to love himself. This picture book about autism can encourage children to love themselves and learn empathy for others. Autism Is…? (Autism Is…? Books) (Volume 1) by Ymkje Wideman-van der Laan & Illustrated by Rob Feldman is written in prose that will delight the children. Autism is explained in a simple way that is appropriate and accessible to small children. This book will help children with autism understand who they are, in a way that is positive and comfortable. The illustrations will be appealing to the kids. How to Be Human: Diary of an Autistic Girl By Georgia Lyon (AKA Florida Frenz) is a book that focuses on Georgia’s journey to learn social skills. The book does an exceptional job at explaining and illustrating how Georgia experienced and processed her autism. Georgia wrote this book so that others, those with and without autism, can better understand that we are all human beings–just packaged differently, and that empowerment comes from understanding ourselves and connecting with others. Although it is a picture book it is geared for older children. A Friend Like Simon by Kate Gaynot gently explores friendship. The book is a good introduction for children on how to be inclusive and discover what is likable about themselves and others. It also explains how some children can find different situations or environments difficult without being scary. Reading this book with the children can help them learn to connect with peers who may be different. Looking after Louis by Lesley Ely & Illustrated by Polly Dunbar is a book about inclusion. Autism and the behaviors that can come with it are adeptly explained. The book does present mainstreaming in a way that I do not personally agree with, though. I want the children to both learn and have social opportunities in their classroom. That being said, children like this book and clearly understand the message of inclusion. The last book, Strictly No Elephants by Lisa Mantchev & Illustrated by Taeeun Yoo is not a book about autism. However, children with or without autism will embrace the message. It is a book about being different and how that feels. This book draws the kids in and invites discussion and observations. While reading this book it would be easy to gently guide the discussion towards how autism can affect how people feel and how they can be empowered and feel included. 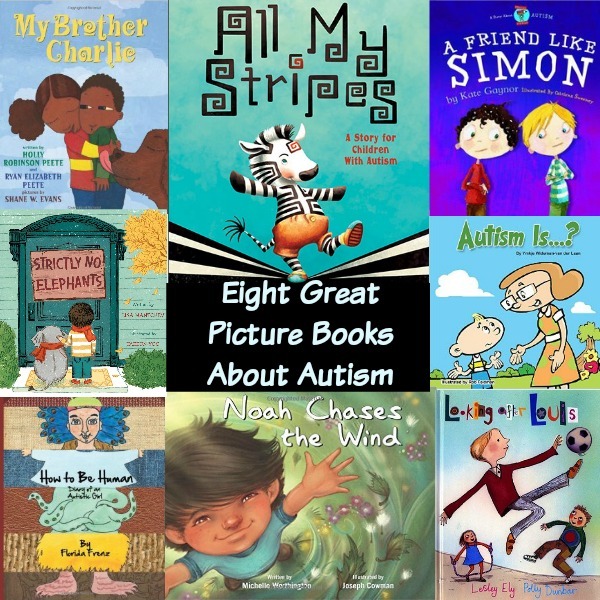 Read the Picture Books About Autism with your children, snuggle with them and discuss their feelings. Read the books with your students. Encourage them to make observations and express their opinions. Reading Picture Books About Autism together can open a whole world of understanding, compassion, empowerment, and self-acceptance. Be Sure to Check Out Some of Our Picture Book Activities!